Timo Boll, ranked eighth in the world in Table Tennis, squared off against KUKA Robotics' 'Agilus' robot and just about managed to win. It may still not be the time for robots to take over the world, but surely that’s going to happen soon. 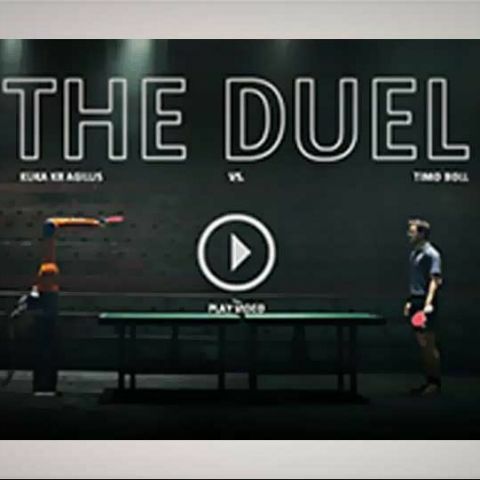 “Agilus” a robot created by KUKA Robotics, a Chinese company, held its own and almost won in a Table Tennis match against a top level athlete. Timo Boll, a German TT player, currently ranked eighth in the sport in global rankings (and who held the No. 1 rank in the past) was able to beat the robot in a tightly contested match organised by KUKA Robotics. Timo Boll is the brand ambassador for KUKA Robotics and the match was organised by the company to publicise its line-up of industrial robots. According to KUKA’s website, the Agilus robot is capable of handling payloads up to 6 kilograms and has a reach of almost 3 feet. The robot itself weighs 52 kilograms and has been designed for operations such as loading, unloading and handling materials, packing and assembling, among others. Unfortunately, the actual video of the match looks heavily edited and spruced up with Hollywood style slow-motion and tracking shots. This does give the impression that the video does not represent the actual match but rather, a cinematic “retelling” of the match. Nevertheless, it is a very cool watch and I’d suggest you stick around till the end to watch Boll playing against multiple Agilus robots.